It’s Thursday, so it’s time to report on my William Morris progress! I intended to finish the details in the bedroom: make pillow covers, install closet door knobs, and hang pictures. Alas, I did none of those things (except wash the pillow fabric so it’s ready to sew). Instead, I tackled some other small jobs on my list, so I do feel as if I accomplished something. In the kitchen, I continued to purge and tidy up several areas. 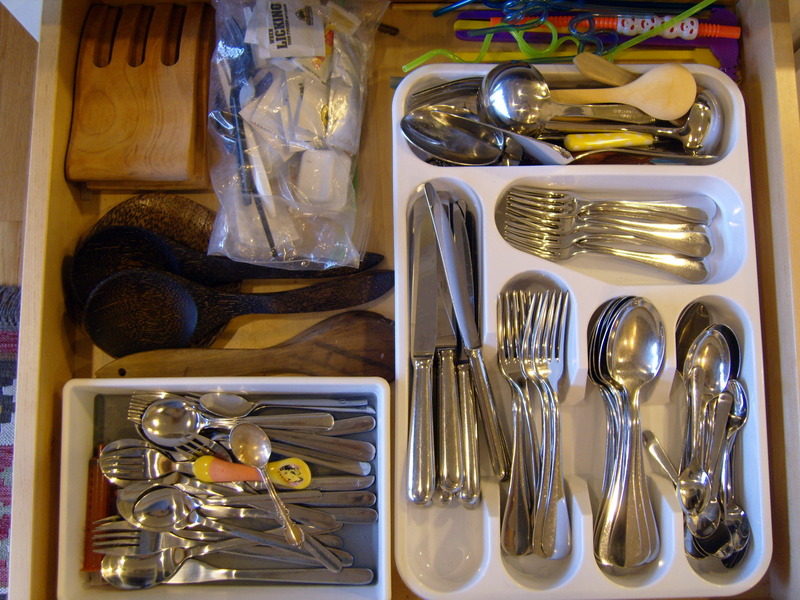 I sorted through the silverware drawer and removed all the baby utensils and medicine cups and spoons. The baby stuff is in the donation bin in the basement, and the medicine cups and spoons are now in the new medicine bin above the refrigerator, right where I need them. 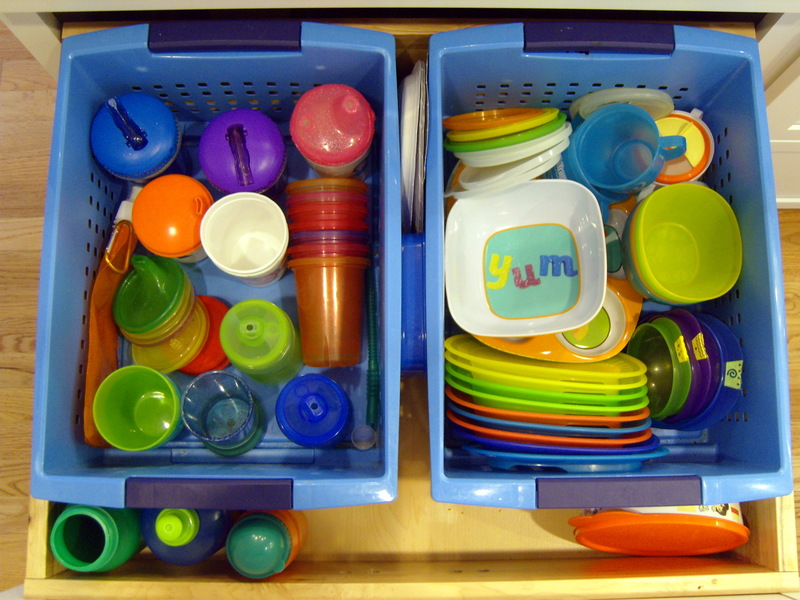 I did a little more purging of the drawer with the kids’ plastic dishes. Goodbye to baby plates that nobody uses, mismatched cups and lids, extra valves and straws for cups we don’t have anymore. Finally, I got up on a stool and cleared everything out of the corner cabinet. It’s where we store our glass and ceramic baking dishes and platters, as well as bread and treats (whatever bits of chocolate or candy may be open). If we have a tin of freshly baked cookies, it lives here, too. We acquired a few new dishes over the holidays, and there were plenty of empty cookie tins and stray chocolate boxes hiding in the corners. I also found a couple pieces that we never use (a ceramic muffin tin and a stone cookie mold). I returned all the cookie tins and unused baking pieces to the basement, tossed the garbage, and found a better way to stack the baking dishes. This week’s loaf of bread is in a basket. Much tidier! My biggest project in the past week was to fix the shower curtain in the kids’ bath. When we removed the shower doors a couple of years ago and replaced them with a curtain rod, we mounted it fairly close to the ceiling. We’ve been using an extra long shower curtain liner, but I had never added a more decorative curtain. Extra long curtains are expensive, and I had a perfectly good, though too short, white waffle weave curtain. Speaking of waffling, I went for months without deciding on some kind of fabric to extend the curtain. But last week when I picked up the special order bedroom pillow fabric from Joann’s, I passed by this new fabric (on sale!) from Lisette, and decided to grab it. 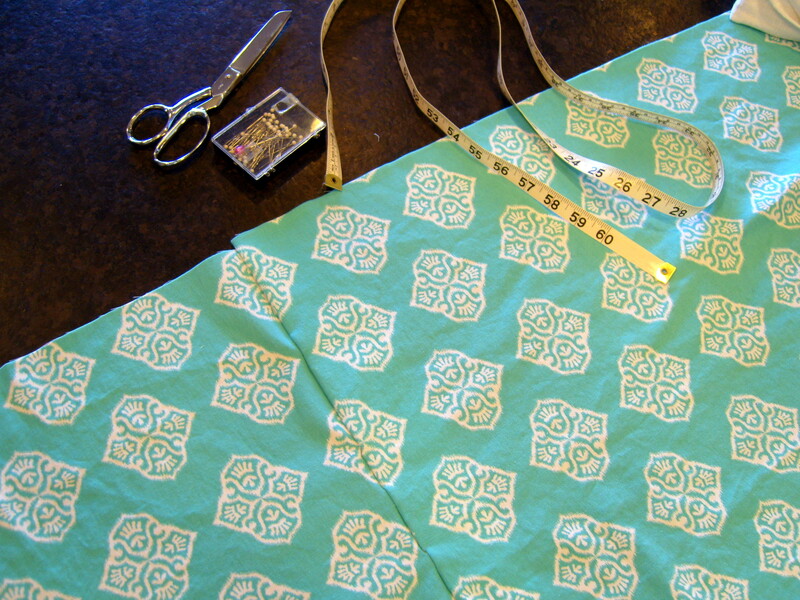 I only bought a yard, and I needed to add about 15 inches to my curtain, so I had to piece the fabric. It was a little challenging to match the pattern and I almost didn’t have enough fabric, but in the end it turned out just right. 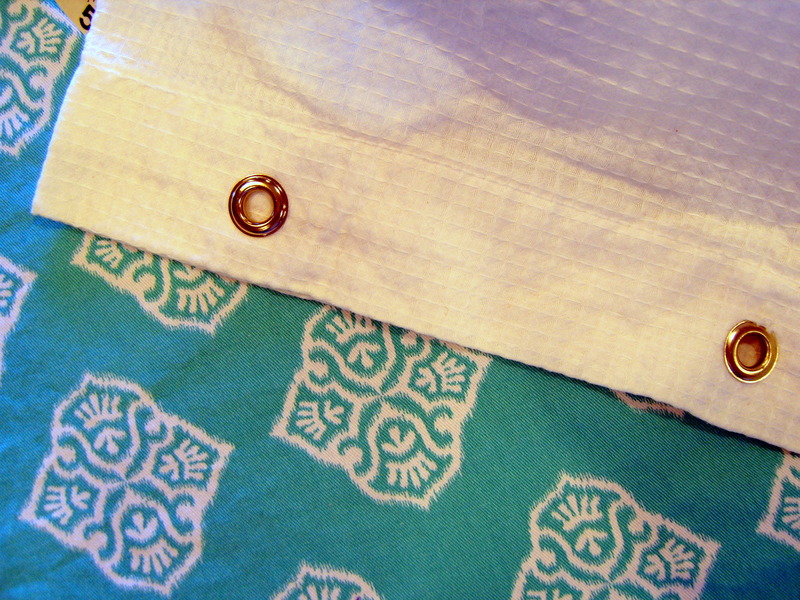 If you’re interested, I followed this tutorial I found for adding a strip of fabric to curtain panels. Now I’m even more motivated to repaint the bathroom. The existing color (Toasted Pine Nut from Sherwin Williams) is the color we have in our kitchen, where I still love it. 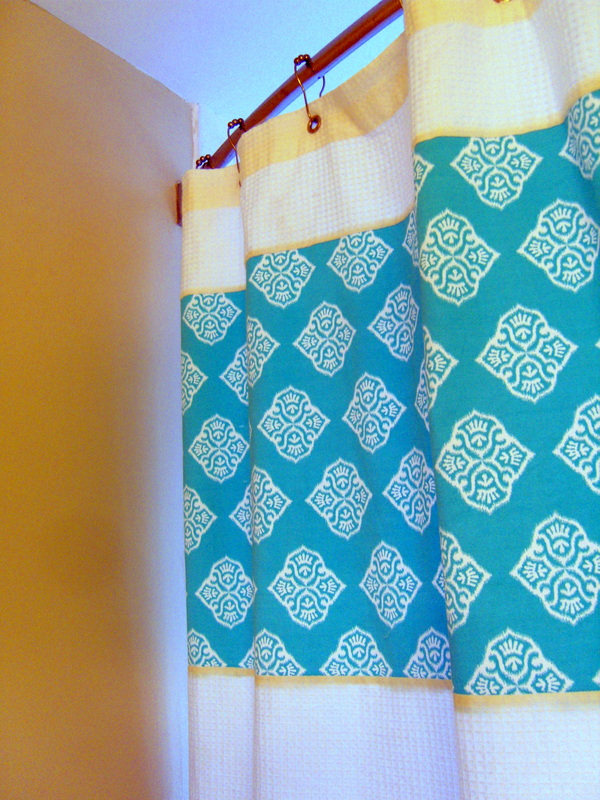 I used it in the bathroom as a kind of test to see if I liked the color, but since I’ve added all the turquoise accessories, it just doesn’t go. I’ve decided I prefer cool colors in the bathroom, anyway. I’m thinking a soft gray…what do you think? Firstly, I want to eat the muffins on your banner! But secondly I love the cloth shower curtain!! We did that a while ago and it makes such a huge difference, saves money smells better. GO GREEN!! The blueberry muffin recipe is in the blog archives. It’s really the best EVER. Our curtain liner is cloth, too–like the ones you find in hotels. LOVE it. I’d hate to have all that smelly plastic in the kid’s bath. LOVE the shower curtain. The turquoise looks really cheery, and is perfect for kids. Painting our bathroom gray I’s on our list too! Still need to find the right shade. Love the shower curtain! I have a freebie quart that didn’t make the cut for the master bedroom, but it might do for the bath. I found that if I slap a big test patch of paint on the wall, I am very motivated to finish the job! the shower curtain looks great! I think that gray would be lovely with the turquoise. I think that Martha Stewart has some really great greys in her paint collection right now, I actually have “Nimbus Cloud” taped to my bathroom wall right now! It’s a warmer grey, which I think helps keep people from looking like corpses in the morning. Nice work on the shower curtain! I would never have known you altered it from the photos! The shower curtain turned out so well. I really like the fabric panel. Where do you buy a cloth liner for the shower? I thought they were all plastic. BTW I have just started painting swatches on my bathroom too. Any ideas for a good selection of curtains? You can find them lots of places. Pretty sure I got mine at Tuesday Morning, but you can find one at Bed Bath & Beyond, Walmart, probably Target. I would check Marshall’s or TJ Maxx, too. Should be $10-15 for a standard one, and they last forever and can be washed. It’s like a rite of passage, to purge all the little kid/baby plastic, huh? A bit sad, but feels & looks better! I really want to clear out my kitchen cabinets too, yours look great! 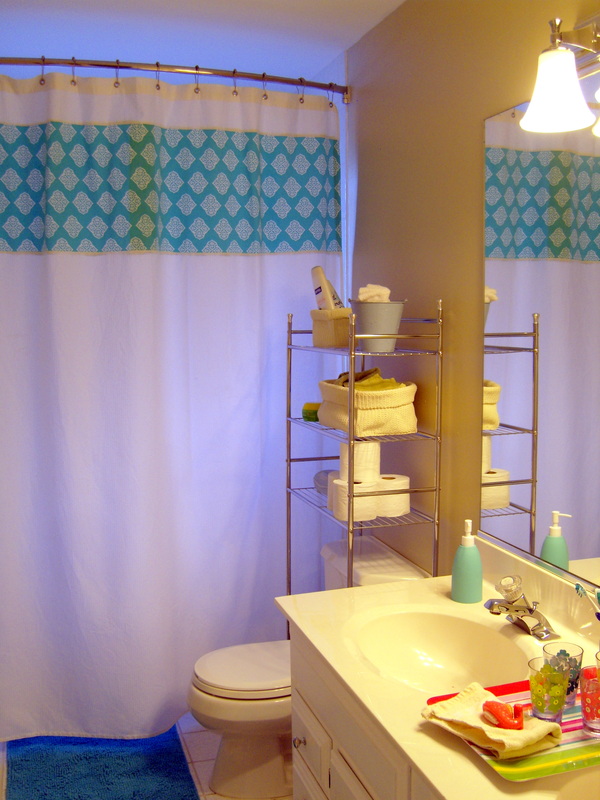 Love your fabric that you chose to add to the shower curtain, that is lovely and a good price too, can’t be beat. I also didn’t know that there are cloth shower curtains to be had for regular people, guess that will be on my next treasure hunt to Tuesday Morning or Marshall’s. Thanks for sharing Melissa!